Aquaman has emerged as one of the great hopes for Warner Bros.’ upcoming Justice League film. This Arthur Curry likes to drink and not cut his hair and fight with weapons that have more than three tines! Suffice to say, this Aquaman is a far cry from his comics counterpart. As excited as everyone is to see Jason Momoa’s Aquaman, there seems to have been a fair amount of confusion as to what kind of weapon he’ll be using to slay parademons when we finally get a chance to see him team up with the Justice League. Because Aquaman traditionally fights with a golden trident in the comics, a number of people have taken to assuming that his Justice League weapon is the same thing. But anyone who’s actually paid close attention to images of Momoa’s Aquaman and understands that the “tri-” prefix implies three of something knows that...well, he’s not using a trident. During a recent interview with Chris Van Vliet, Momoa set the record straight and explained that that thing in his hand is actually a quindent (five tines, folks) that he borrows from his wife. I didn’t call it a trident. It’s a quindent. We don’t call it that in the movie and when you watch Aquaman you’re going to see him go for the trident, so everyone’s just got to stay tuned for a hot minute. He’s not the king yet. He looks to Mera and he goes “I need to borrow something. I need you to do me a favor” so that’s when she gives him the equipment. So, we know that Aquaman’s trident exists somewhere in the DCEU, but it just isn’t the weapon he ends up using to save the world this time around. We do know from Momoa that Justice League is just “a weekend” in Aquaman’s life and it’s his solo movie where we’ll really understand the character. Maybe that’s when he gets his trident, too. 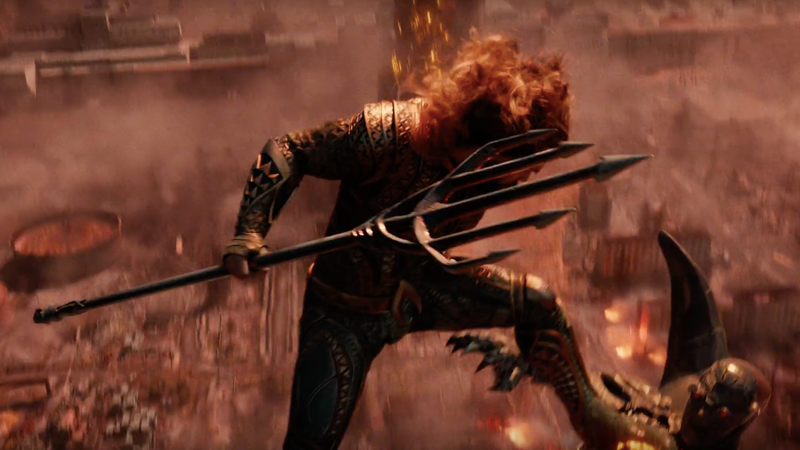 Here’s to hoping that the king of Atlantis ends up losing his hand during Justice League and we end up seeing him with a trident replacement when his solo film hits theaters.